CrowdSpring, online at crowdspring.com, is a leading marketplace for logos, graphic design, and naming. CrowdSpring makes it easy and affordable for businesses to find the perfect logo or design for their website, packaging, or product. Clients simply post what they need at CrowdSpring.com, and talented designers and writers submit their work, from which clients make their selections. CrowdSpring features over 120,000 artistic professionals, and has a record of satisfying customers' needs. So shop for your ideal logo, graphic design, web design, or name at CrowdSpring, and get all the latest CrowdSpring.com discounts, CrowdSpring promotions, and CrowdSpring coupon codes found here at RetailSteal.com. Save $20 on your first project at CrowdSpring. Click here to start. Save $20 on your next project at CrowdSpring.com. Click here to register today and save. 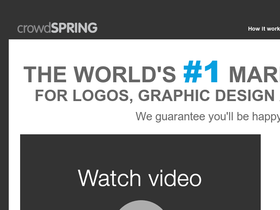 Get the logo of your dreams from CrowdSpring. Click here for logo design packages starting from $269. Name your own price at CrowdSpring. Click here to request a logo, design, or name. Client posts on CrowdSpring receive an average of 110 submissions from talented designers and writers. Clients select their favorite submissions. Click here to find out more. Shop at crowdspring.com and save $20 plus get a free advances promo feature. Click here for code.